This image, taken by NASA's Mars rover Curiosity in August 2014, looks across the northeastern end of sandy "Hidden Valley" to the lower slopes of Mount Sharp on the horizon. The 1-ton Curiosity rover had been heading for Mount Sharp — a 3.4-mile-high (5.5 kilometers) mountain in the center of Mars' Gale Crater — via "Hidden Valley," a sandy swale that's about the length of a football field. 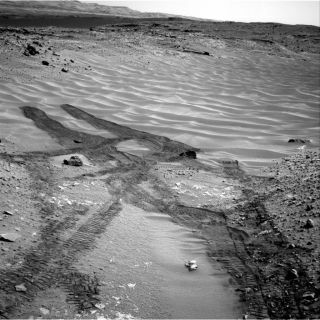 But Curiosity turned back shortly after entering the valley's northeastern end earlier this month, finding the sand surprisingly slippery, NASA officials said. This photo taken on Aug. 12, 2014 by NASA's Curiosity Mars rover shows an outcrop that includes the "Bonanza King" rock under consideration as a drilling target.